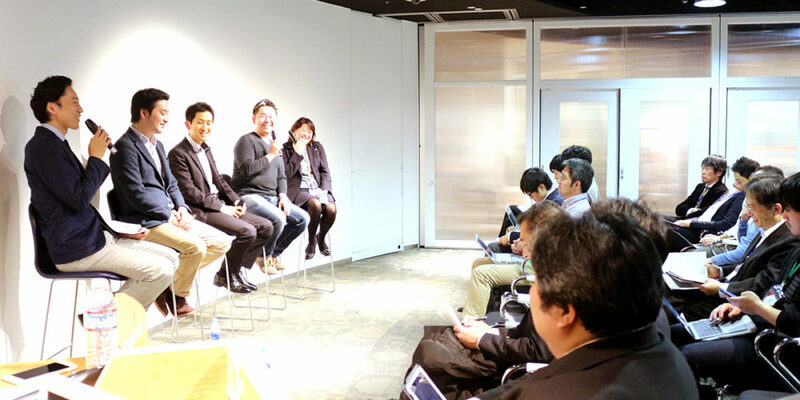 addlight Inc.’s Mirai Salon 6 event was held at the EGG Japan space in central Tokyo in December 2017. 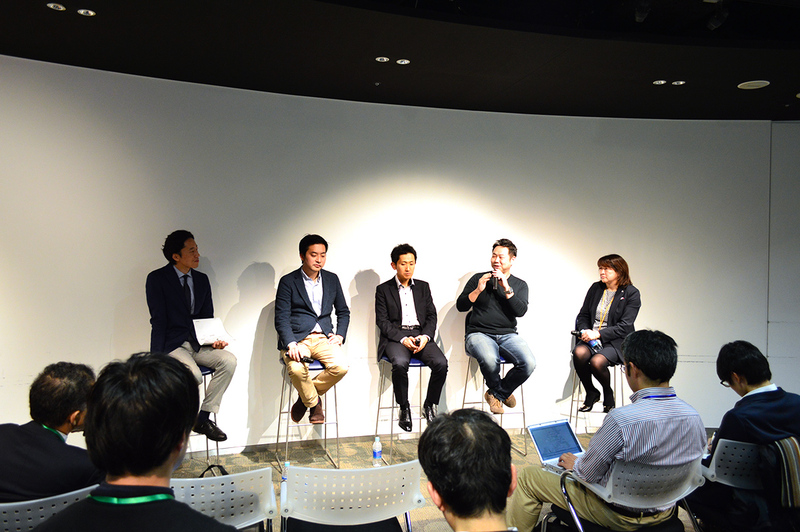 Mirai Salon events bring together experts in the field of Open Innovation, who share use cases in such areas as robotics, automobiles, and next-generation tech. On this occasion, three forward-thinking corporates and a cutting edge retail automation startup made presentations before an enthusiastic full-house. Yuuki Kuriyama from the Technical Planning Division at DENSO Corporation was the first to speak. While DENSO is known around the world as a top-tier carmaker, the company is also engaged in making a wide range of products, including robots, QR code readers, and even “wine savers,” Kuriyama said. Yuuki Kuriyama from DENSO Corporation speaking at addlight Inc.’s Mirai Salon 6 event. There is a paradigm shift taking place in the automotive industry, he added, especially since the entry of IT giants from other industries into the sector, and the advent of products like connected cars, electrification of automobiles, and AI-enabled vehicles. To meet these challenges, there is a need to work across organizational barriers, advance Open Innovation across industries, and enhance collaboration between large companies, SMEs, and startups. To this end, DENSO invested in the Innovations and Future Forum Inc. (Mirai Souzou), an entity tasked with supporting research in technology and new business creation, while exploring ideas emerging from the Tokyo Institute of Technology. The company also holds industry events and engages other organizations while enhancing its network of collaborators, Kuriyama added. In early 2017, DENSO established a special department to promote Open Innovation, and in summer of that year, underwent reorganization with a view to accelerate its innovation activities. Innovation at DENSO seems to be gaining momentum. The next speaker was Takashi Uehara, the CEO of Japan Digital Design Co., Ltd. (JDD), a FinTech company and spin-off of Mitsubishi UFJ Financial Group Inc’s (MUFG’s) Innovation Lab (See the press release). Uehara noted that there was some tension when JDD was created—the upper management of MUFG, for instance, had a focus on innovation, while the budget management division and the business development section were averse to risk, resulting in a delay in early progress. 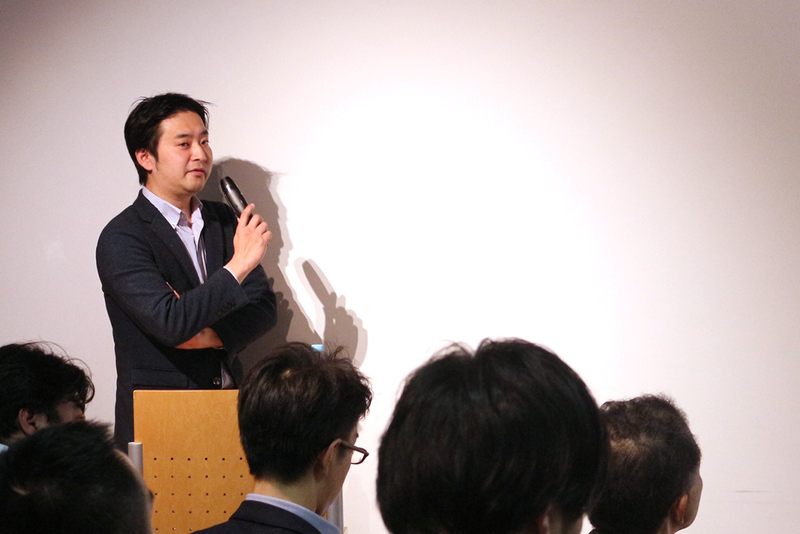 Takashi Uehara of Japan Digital Design Co., Ltd. speaking at addlight Inc.’s Mirai Salon 6 event. JDD, he continued, has created an environment where innovation is built on two pillars. The first is to ensure the company’s independence. The second is to streamline reporting lines by reducing the number of presentations to C-level staff to 5 people every three months. Uehara advised that there is no need to create new organizational structures from scratch if you don’t have design thinking experience for things like UI/UX creation. In such cases, you can cooperate with a design company, hire UX and prototype creation engineers directly (as JDD has done), and be ready to incorporate their feedback as much as possible. JDD, Uehara added, has implemented a flexible employment system which allows employees to work part-time on a project-by-project basis, in part because finding talented workers who can commit to full-time work is hard to achieve. While the company has promoted Open Innovation at the MUFG Innovation Lab, their aim is to build a new FinTech UX platform and to leverage their own engineering capabilities in building a new business. Miho Tanaka, the Business Innovation & Planning Manager at Nihon Unisys Co., Ltd., a company that serves the B2B systems integration market, followed. 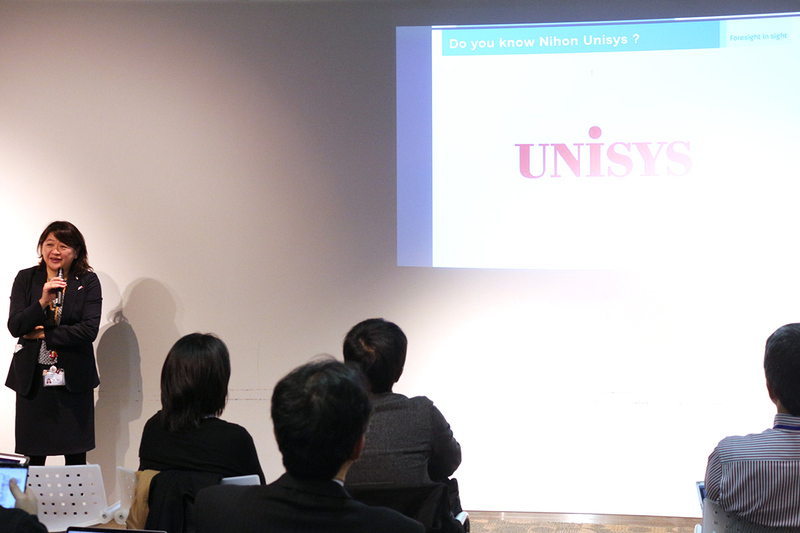 Some four years ago, Nihon Unisys began promoting Open Innovation under its marketing division. Led by the Chief Marketing Officer (CMO), the company’s executives participate as mentors, share information on startup trends, and make themselves available for periodic breakfast meetings where staff discuss externally-driven needs and solutions. 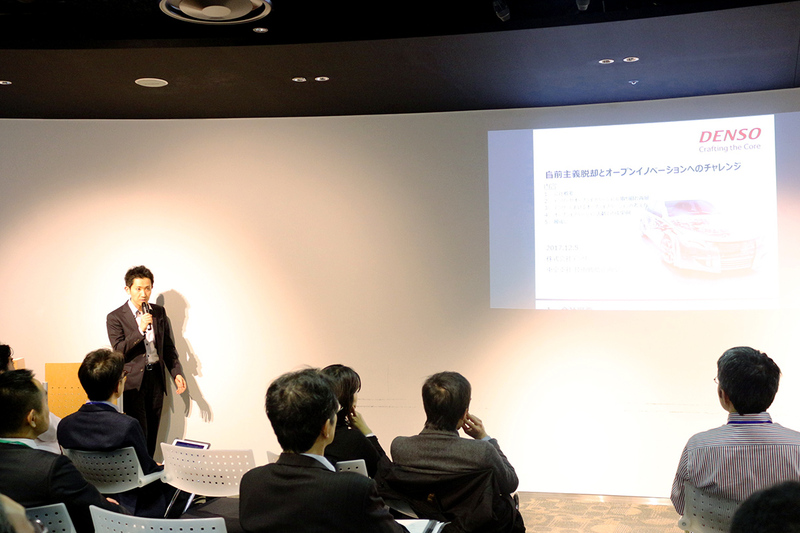 Miho Tanaka from Nihon Unisys Co., Ltd. was an invited speaker at addlight Inc.’s Mirai Salon 6 event. A separate department has also been established, Tanaka continued, to support business plan development in collaboration with curated partner companies, in addition to planning ideas-driven projects designed specifically for commercialization. 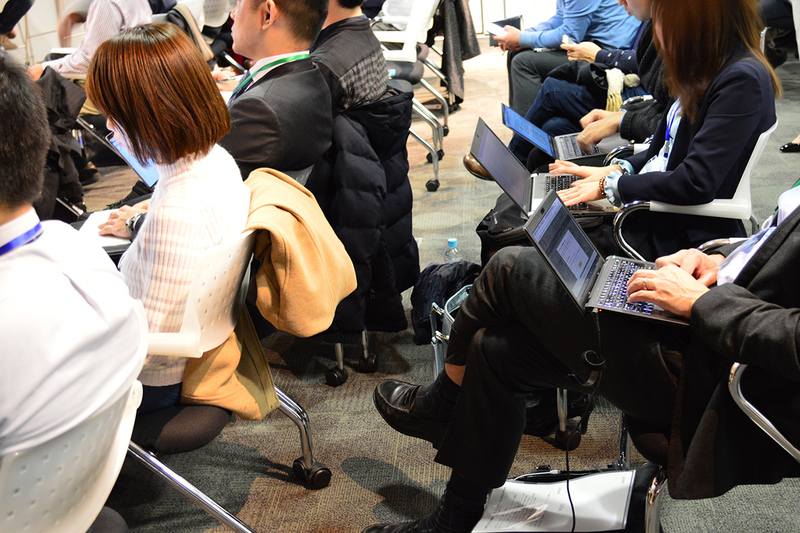 Nihon Unisys is working to create new businesses in collaboration with several accelerated companies, tech startups, and university research institutes. The company has established its own corporate venture capital (CVC) fund, as well as a Real Tech Fund collaboration and investment strategy with partners with which it has found a synergy. The Todai to Texas initiative, which brings companies from The University of Tokyo to the SXSW conference in Texas, and a lab for the promotion of bioscience business in Tsuruoka City, Yamagata Prefecture, are examples of their projects. The last speaker was Representative Director at UsideU Co., Ltd., Junji Takaoka. Takaoka introduced a collaborative robot (Co-Bot) called Ayadoroid. Ayadoroid has been deployed by theme park operator Huis Ten Bosch and travel agent H.I.S Co. Ltd. The co-bot operates in an “Odd Bar”—an automated bar where it acts as a retail representative to visitors. 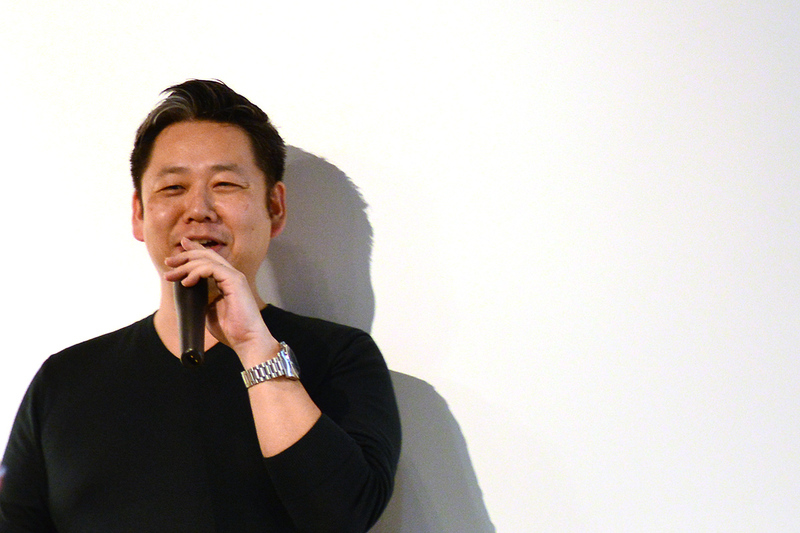 Junji Takaoka from UsideU Co., Ltd. was also a guest speaker at addlight Inc.’s Mirai Salon 6 event. Such AI-enabled co-bots, Takaoka noted, can learn human facial expressions, and automatically correct for their own unnatural expressions and movements. They can be used in unattended customer service stations, without a noticeable decline in the quality of service. Automation via co-bots and their ilk may actually enhance customer services, he noted. Takaoka himself helped to launch Alibaba.com Japan. He had previously worked on increasing electronic commerce (EC) conversion rates (the portion of mail order sales as a percentage of total retail sales) in China. Automation of such processes may provide the necessary efficiencies to account for the missed opportunities in EC conversation rates. Takaoka mused on whether Ayadoroid and other co-bots like it may one day join the sales force of a company, if they can be developed to a point where they provide genuine customer service. Following the presentations, there was a panel discussion moderated by addlight Inc.’s Tadaaki Kimura. When asked about his Open Innovation collaborations with other companies, Kuriyama from DENSO noted that, while one year or so had already elapsed since partnering with the automotive company, a product was yet to be released. addlight Inc.’s Mirai Salon 6 event was attended by innovative corporates who offered probing queries in the Q&A session and networking opportunity. Tad from addlight noted that there are always innovations (whether they are technologies or services) that a large corporation, even one with 150,000 employees, cannot imagine doing. What is more, DENSO keeps an open and flexible mind when it comes to collaborating with startups (even foreign ones), or borrowing ideas from outside the company. Kuriyama noted future plans to collaborate with Huis Ten Bosch and stressed the importance of ensuring buy-in from all stakeholders in order to avoid divergence in the goals of the partners. Uehara, who joined the banking industry as a new graduate before he joined MUFG and its spin-off JDD, was asked about his experience in innovation. Even when he was in retail banking, he said, he was interested in Silicon Valley, in particular its accelerator culture. When the opportunity came to request a move into the innovation space, he did so after speaking with headquarters. It was important for him to experience the freedom that comes with working in a startup, albeit a spin-off. After the panel discussion, an enthusiastic Q & A session followed. The wide-ranging questions covered such areas as the limitations of Open Innovation, the danger of wholesale importation into Japan of Silicon Valley business models, and the comparative strength of Japanese startups. A networking opportunity with light refreshments was also available for attendees. addlight’s Mirai Salon series are co-sponsored by Mitsubishi Estate Co. Ltd. For more information on previous and future events, follow us via addlight journal (in English and Japanese) or on social media: Facebook. VENTURE BUILDER: The Next Wave in New Business Creation? Common Ground—Malaysia’s gateway to ASEAN? ©Copyright addlight Inc. All Rights Reserved.